One of our software applications calls up Microsoft Word in order to print customer receipts. Each time a receipt is printed, it halts midway through and we're presented with the attached dialog box. If we click yes, the receipt prints as normal but it really is disruptive to the workflow. Is there any way to suppress this notification within Word or add an exemption of some sort? You need to change your software application so that it does not need external fields. I assume this may be possible. 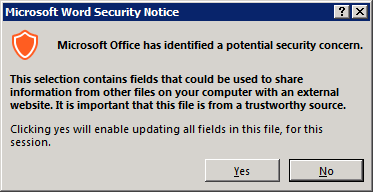 Otherwise, for users to suppress these warnings in their Word, they will have to reduce security warnings that they need to protect their computer. Thanks, I will touch base with our developer and see if he can make the changes to the application. Thank you and I hope they can help you. New Office Update caused this issue. Icons disappear for a while. Then they come back and errors go away. We required this to stop because we merged several Word documents into a single PDF and it errored out. There were new Office updates out just this morning, so you may also wish to try updating Office. Tried that. The Office client update stated there were no new updates available for the set of computers tried. There is not a uniform eligibility for updates now when it comes to the update process for some reason on certain computers. I could have also tried the following update trick the other direction forward and past the update I have, but I didn't try it. The one I did try, solved the issue. Here is the update to force forward if your Office application says you are up to date. This has not been tested, but the above solution works for sure. This would force Office to bypass the update check and explicitly apply the newer version. This one was not tested but may work if it contained the cure for the "Microsoft Office has identified a potential security concern" prompt. The four fields that violated this don't make any sense. They were Author of the document, the Last modified by, the header and the footer. The four prompts for that pop-up. Because these fields are potentially shared when you pass on the information, "you private information will be shared with others" rule is a Document inspection violation. The problem is even if they are all blank, the document still gives the popup because it is a bug due to the fact the fields were touched and still have the potential. ??? Why. Previous version worked. You are right, usually the next quickie update is a self fix. For all others, this is the temporary fix. Just to give everyone an update. I updated Office365 forward to a newer version as suggested (currently on v16.0.10827.20118) and that seems to have resolved the issue. We're now able to print our receipts without any security errors.